Background and objectives Dent disease is a rare X–linked disorder characterized by low molecular weight proteinuria and often considered a renal tubular disease. However, glomerulosclerosis was recently reported in several patients. 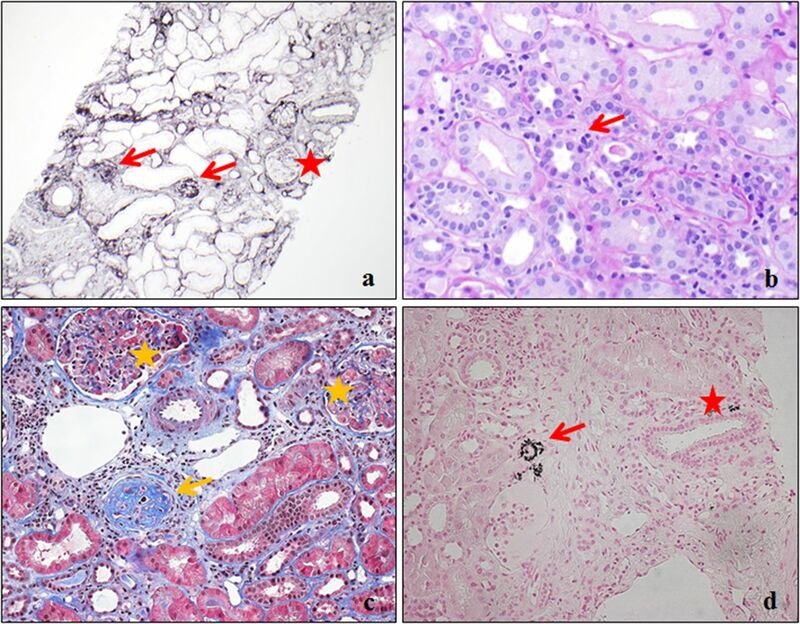 Thus, Dent disease renal histopathologic features were characterized and assessed, and their association with kidney function was assessed. Design, setting, participants, & measurements Clinical renal pathology reports and slides (where available) were collected from 30 boys and men in eight countries who had undergone clinical renal biopsy between 1995 and 2014. Results Median (25th, 75th percentiles) age at biopsy was 7.5 (5, 19) years with an eGFR of 69 (44, 94) ml/min per 1.73 m2 and a 24-hour urine protein of 2000 (1325, 2936) mg. A repeat biopsy for steroid-resistant proteinuria was performed in 13% (four of 30) of the patients. Prominent histologic findings included focal global glomerulosclerosis in 83% (25 of 30; affecting 16%±19% glomeruli), mild segmental foot process effacement in 57% (13 of 23), focal interstitial fibrosis in 60% (18 of 30), interstitial lymphocytic infiltration in 53% (16 of 30), and tubular damage in 70% (21 of 30). Higher percentages of globally sclerotic glomeruli, foot process effacement, and interstitial inflammation were associated with lower eGFR at biopsy, whereas foot process effacement was associated with steeper annual eGFR decline. Conclusions These associations suggest a potential role for glomerular pathology, specifically involving the podocyte, in disease progression, which deserves further study. Furthermore, Dent disease should be suspected in boys and men who have unexplained proteinuria with focal global glomerulosclerosis and segmental foot process effacement on renal biopsy. Dent disease is a rare X–linked inherited disorder first described in 1964 (1) that is characterized by low molecular weight proteinuria (LMWP) and hypercalciuria (2,3). Mutations in CLCN5 account for approximately 60% of patients (Dent disease 1; OMIM300009), whereas mutations in OCRL1 account for approximately 15% (Dent disease 2; OMIM300555); another 25% of patients lack molecular genetic characterization (2,4). Patients often develop nephrocalcinosis, kidney stones or CKD, but the phenotype of Dent disease varies, which can make diagnosis difficult (4,5). Increased LMWP (e.g., retinol binding protein, α1-microglobulin, and β2-microglobulin), typically 10-fold normal, is characteristic (2). However, because LMWP is not routinely measured and the phenotype can overlap with other causes of proteinuric CKD and/or urinary stone disease (6), the disease is likely underdiagnosed or diagnosed late after patients have failed an immune suppression regimen. Dent disease has largely been considered a disease of the tubules (7), although glomerulosclerosis was also described (7,8). Early studies revealed that CLC-5, encoded by the CLCN5 gene, was expressed in the proximal tubules, thick ascending limbs of the Henle loop, and collecting ducts, thus explaining certain features of the phenotype, such as LMWP (9). A recent study documented that ClC-5 is also expressed in human podocytes, and ClC-5 overexpression was detected in biopsies of certain proteinuric patients without Dent disease (10). However, the physiologic function of CLC-5 in podocytes is not known, and also, the consequences of its absence are not known. Furthermore, small case series of patients with CLCN5 mutations, focal global glomerulosclerosis, and varying degrees of hypercalciuria have recently been reported (11,12). Thus, glomerular pathology may be more common than previously recognized in Dent disease. Hence, in this study, we characterized Dent disease renal histopathologic features in a larger cohort and their association with kidney function. This study was approved by the Mayo Clinic Institutional Review Board and the Ethics Committee for experimental studies of Azienda Ospedaliera of Padovain, Italy. The Rare Kidney Stone Consortium (RKSC) Registry data were reviewed to identify patients with Dent disease and previous clinical kidney biopsies. These patients were sent a letter inviting participation in this study. After informed consent, their official pathologic reports and original slides (if available) were obtained for review. Other patients with Dent disease not in the registry who learned of our study were also allowed to participate after consent. Dent disease 1 was confirmed by pathogenic mutations of the CLCN5 gene. Dent disease 2 was confirmed by pathogenic mutations of OCRL1. Patients considered to have Dent disease of nontype 1 or 2 had marked LMWP and nephrocalcinosis or hypercalciuria with no identifiable secondary causes but were negative on testing for mutations of CLCN5 and OCRL1. General information, clinical manifestations, and laboratory results, including serum creatinine and 24-hour urine protein, were abstracted from the RKSC Registry data. Renal function was assessed by serum creatinine values to estimate GFR using the Schwartz equation (13) in children <18 years old and the Modification of Diet in Renal Disease equation (14) in adults. Body surface areas were calculated from height and weight using the Du Bois formula (15). Values obtained nearest to and within 1 year of the biopsy were considered for analysis. Clinical renal pathology reports were reviewed independently by two researchers (X.W. and A.J.M.) to confirm interpretations. Original slides from six patients were collected and reviewed by L.H.H., a board–certified renal pathologist at the Mayo Clinic. Results were expressed in the form of means±SD or medians (25th, 75th percentiles) for continuous variables and percentages for categorical variables. Scatterplots were generated to explore the relationship of age with the percentage of globally sclerotic glomeruli and kidney function. Generalized estimating equation models were fit to assess the association between age and eGFR during follow-up. Linear regression models were used to explore the relationship of the percentage of globally sclerotic glomeruli with tubulointerstitial findings and the relationship of histopathologic characteristics with kidney function both at biopsy and during follow-up. Multivariate models assessed the independence of histopathologic characteristics that associated with kidney function. P values <0.05 were considered to be statistically significant. All statistical analyses were performed using JMP, 10.0 (JMP Statistical Discovery, Cary, NC) or SAS, 9.4 (SAS Institute Inc., Cary, NC). As of July of 2015, pathology reports from clinical kidney biopsies of 30 boys and men in eight countries performed between 1977 and 2014 were collected. Their demographic and clinical characteristics are shown in Table 1, with the corresponding genetic testing results and biopsy indications shown in Supplemental Table 1. A majority (86%; 26 of 30) were Dent disease 1, whereas 7% (two of 30) were Dent disease 2, and 7% (two of 30) lacked mutations in CLCN5 or OCRL1 (i.e., neither type 1 nor type 2) but met clinical criteria for Dent disease. Median (25th, 75th percentiles) age at biopsy was 7.5 (5, 19) years old, whereas eGFR within 1 year of biopsy was 69 (44, 94) ml/min per 1.73 m2, and 24-hour urine protein was 2000 (1325, 2936) mg. The mean BP (when measured) was 105/61 mmHg, and none of the patients had a history of hypertension at the time of biopsy or during subsequent follow-up. All patients manifest increased excretion of LMWP when assessed (24 of 24), and 80% (20 of 25) had hypercalciuria. Only a minority (18%; five of 28) had a history of kidney stones, and 14% (three of 21) had rickets. Data for urine albumin were not available in the vast majority of patients, but the serum albumin was within the normal range in patients when measured (4.5±0.43 g/dl; n=12). A subset (17%; five of 30) of patients had repeat biopsies; of these, 80% (four of five) were performed for steroid-resistant proteinuria. Biopsy slides were available for six patients with Dent disease 1 for review by a single renal pathologist (L.H.H.). Representative findings are displayed in Figure 1. Prominent features included focal global glomerulosclerosis and interstitial fibrosis. Notably absent were features to suggest focal segmental sclerosis or glomerular inflammation. Interstitial inflammation was noted only adjacent to sclerotic glomeruli. Nephrocalcinosis was detected in two patients, but it was only prominent in areas of those biopsies that happened to be near the corticomedullary junction. Renal histopathologic features in Dent disease 1. (A) Glomeruli with global sclerosis (arrows) and intact glomerulus (star). Silver (×1000). (B) Tubulitis (arrow). Periodic–acid Schiff (×1000). (C) Globally sclerotic glomerulus adjacent to the interstitium with lymphocytes infiltration (arrow) and intact glomeruli (stars). Masson Trichrome (×2000). (D) Calcium phosphate crystals in the tubule (arrow) and interstitium (star). Von Kossa (×1000). Major histopathologic findings from the clinical renal pathology reports are listed in Table 2. Focal global glomerulosclerosis (a representative example is in Figure 1A) was reported in 83% of patients, with the median (25th, 75th percentiles) percentage of globally sclerotic glomeruli of 9.5% (2.2%, 24.3%). FSGS was documented in only 7% (two of 30), although FSGS was still reported as suspected in 17% (five of 30). Focal segmental glomerular capillary collapse was reported in two other patients (7%) who had no evidence of FSGS. Foot process effacement was noted in 57% of the patients (13 of 23), but it was segmental in all patients (13 of 13) and mild in the vast majority (12 of 13) (Table 2). The glomerular basement membrane was normal in the majority (85%; 17 of 20), with slightly thickened or thin basement membranes reported in only 10% (two of 20) and 5% (one of 20), respectively. Other infrequent glomerular findings included mild mesangial hypercellularity (13.3%; four of 30), cellular crescents (3.3%; one of 30), cystic transformation with dilation of the glomerular urinary space and embryonic structure (3.3%; one of 30), and mild to moderate thickening of Bowman’s capsule (3.3%; one of 30). Immunofluorescence staining was negative or nonspecific in all patients. As shown in Table 2, the main tubulointerstitial findings were focal interstitial fibrosis (60%; 18 of 30), interstitial lymphocytic infiltration (53.3%; 16 of 30), and tubular damage (70%; 21 of 30), including tubular atrophy, tubular dilation, or tubulitis (a representative example is in Figure 1B). The severity of these lesions was mild in the vast majority of patients. As shown by the example in Figure 1C, interstitial fibrosis and inflammation were located adjacent to a sclerotic glomeruli in three patients, whereas in 27 pathology reports, fibrosis and/or inflammation were mentioned, but the distribution was not described. Presence of a higher proportion of globally sclerotic glomeruli was associated with interstitial fibrosis, interstitial inflammation, and tubular damage (Table 3). Other infrequent tubulointerstitial findings included focal giant mitochondria with dense condensation in proximal tubular epithelial cells in one patient and dilation of the endoplasmic reticulum in the proximal tubules in another patient (noted by electron microscopy). Blood vessels were unremarkable in the majority of patients (88%; 22 of 25), with mild vascular smooth muscle hypertrophy or hyperplasticity in a minority of patients (12%; three of 25). Nephrocalcinosis was only reported in 20% (six of 30). As shown in Figure 1D, the nephrocalcinosis was present in either the interstitium or the lumen of distal tubules or collecting ducts. Because of the limited number of samples that had specific staining for calcium, statistical analyses were not performed to assess the association of nephrocalcinosis with tubulointerstitial features. However, it is notable that tubular damage was reported in the vast majority of patients (five of six) with histopathologic nephrocalcinosis. As shown in Figure 2A, older age at biopsy was associated with a higher percentage of globally sclerotic glomeruli (P<0.001). The percentage of globally sclerotic glomeruli was generally much higher than the published proportion in healthy age–matched living kidney donors and/or autopsied human kidneys (Figure 2A, Supplemental Table 1) (16,17). Interstitial inflammation and tubular damage were more likely to be present in older patients with Dent disease (P=0.04 and P=0.05, respectively). Two patients had initial biopsies at ages 4 and 5 years old, with subsequent biopsies for steroid-resistant proteinuria 15 and 32 months later, respectively. The percentage of globally sclerotic glomeruli increased from 0% to 11% in the first patient and from 15% to 17% in the second patient, respectively. Older age at biopsy was associated with higher percentage of globally sclerotic glomeruli and lower kidney function. (A) Association of age at biopsy with percentage of globally sclerotic glomeruli (solid line; P<0.001). Age–matched estimated percentage of globally sclerotic glomeruli (line with stars) was generated using the 95% upper limit of globally sclerotic glomeruli present in a large cohort of healthy living kidney donors (on the basis of an average of 16 glomeruli per biopsy) (16). (B) Association of age at biopsy with eGFR (P<0.01). As shown in Figure 2B, older age at biopsy was associated with lower eGFR (P<0.01). In Figure 3, 18 patients had multiple follow-up visits with a median period of follow-up of 3 (1, 7) years. During follow-up, average eGFR decline was −2.21 (95% confidence interval, −3.03 to −1.37) ml/min per 1.73 m2 per year (P<0.001). eGFR decline during follow up. 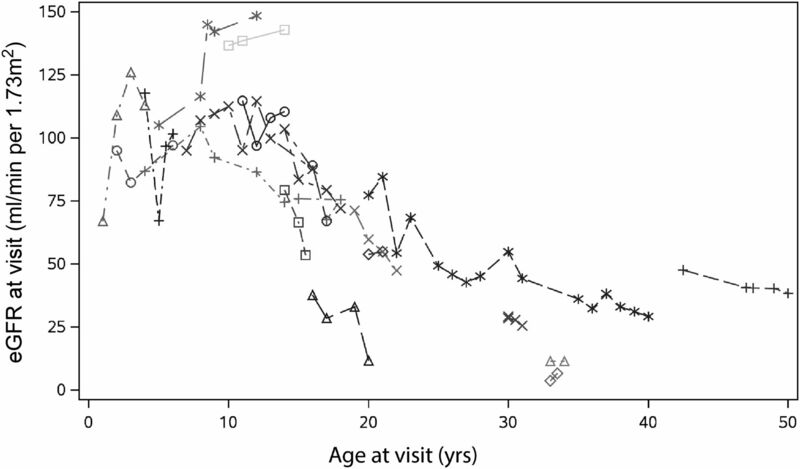 Plot of age and eGFR at follow-up visits for 18 patients. As shown in Table 4, in a univariate model, a higher percentage of globally sclerotic glomeruli, interstitial inflammation, and foot process effacement was associated with a lower eGFR at biopsy. In a multivariate model (including percentages of globally sclerotic glomeruli, interstitial inflammation, foot process effacement, and age), the association of foot process effacement at biopsy and eGFR remained (Table 4). Higher 24-hour urinary protein was associated with lower eGFR at biopsy (P=0.003) and higher percentage of globally sclerotic glomeruli (P=0.01) but not interstitial fibrosis, interstitial inflammation, tubular damage, nephrocalcinosis, and foot process effacement. These associations persisted after adjustment for body surface area (P=0.01 and P=0.04, respectively). As shown in Table 5, the presence of foot process effacement was associated with a steeper annual eGFR decline during follow-up after biopsy but not associated with the percentage of globally sclerotic glomeruli or the presence of interstitial fibrosis, interstitial inflammation, tubular damage, or nephrocalcinosis. This association persisted after adjustment for age. Repeat analysis was performed after excluding two patients who did not have Dent disease 1 or Dent disease 2. The associations of histopathologic features with age and kidney function did not significantly change. Focal global glomerulosclerosis was also present in patients with Dent disease 2 or Dent disease nontype 1 or 2 (Supplemental Table 1). In this study, focal global glomerulosclerosis was present in the large majority of patients with Dent disease. The percentage of globally sclerotic glomeruli was strongly associated with kidney function and age at the time of biopsy. Indeed, the percentage of globally sclerotic glomeruli among adults was far in excess of that expected for age; equally robust reference ranges are not available for the pediatric age range. Foot process effacement was also associated with eGFR both at the time of biopsy and during subsequent follow-up, but it was mild and segmental. It is notable that global glomerulosclorosis was associated with kidney function at the time of biopsy but not associated with it during the follow-up. This observation might suggest that global glomerulosclorosis is the final step/downstream of the process of glomerular injury, whereas foot process effacement is an early step/upstream of this injury. The presence of foot process effacement at biopsy may suggest that injury is ongoing in the glomeruli, which could lead to a continuous decline in kidney function over follow-up. Evidence for tubular injury and the presence of interstitial fibrosis and inflammation were also observed along with microscopic nephrocalcinosis but only when the biopsy contained corticomedullary tissue. These results show that glomerular pathology is common and associated with declining kidney function in this inherited disorder, generally believed to be a disease primarily of tubules. One unanswered question is whether global glomerulosclerosis is entirely secondary to tubular injury or if podocyte dysfunction also plays a role. The tubular dysfunction of Dent disease is well described along with the associated clinical manifestations of LMWP, hypercalciuria, nephrolithiasis, CKD, and hyperphosphaturia (8,18). Several features have been attributed to impaired proximal tubular endocytosis (19,20). Indeed, it has been documented that CLC-5–deficient male mice develop most of the manifestations of Dent disease and have in vivo defects of proximal tubular endocytosis because of the lack of ClC-5 protein within early endosomes (20). In addition, studies have shown that endocytosis in the pronephric tubule is impaired in OCRL1–deficient zebrafish embryos (21). Early studies using immunohistochemistry revealed that ClC-5 was expressed in the epithelial cells lining the proximal tubules and the thick ascending limbs of the loop of Henle and in the intercalated cells of the collecting ducts (9). Recent immunolocalization studies have also shown that ClC-5 is present in podocyte foot processes of patients without Dent disease (10). Furthermore, Podocyte ClC-5 overexpression was observed in biopsies from proteinuric patients with diabetes and IgA nephropathy, suggesting the possibility of podocyte protein endocytosis (10). In fact, glomerular podocyte vacuolization has been observed by others in renal biopsies from severely proteinuric patients (10,22). In our study, podocyte foot process effacement was commonly seen in patients with Dent disease, and it was associated with impaired kidney function. However, the degree of foot process effacement was mild and segmental. Overall, it remains possible that the podocyte may actively rather than passively be involved in the process of global glomerulosclerosis associated with Dent disease, and further studies are needed. In this study, tubulointerstitial injury was commonly present and associated with the proportion of globally sclerotic glomeruli; in some patients, it was also observed adjacent to sclerotic glomeruli. These findings may be consistent with our hypothesis that the glomerulosclerosis might be the result of the combination of primary podocyte injury and reaction secondary to tubulointerstitial lesions. Another important finding in this study is that a trial of steroid and immunosuppressive treatment was not uncommon because of a suspicion of FSGS, which was on the basis of the combination of focal global glomerulosclerosis and absence of severe tubulointerstitial damage. In addition, several patients in this study as well as previously reported patients (7,23) had a repeat kidney biopsy caused by steroid-resistant proteinuria. Such patients illustrate that wider appreciation of the pathologic features of Dent disease may be crucial to allow an early and correct diagnosis and avoid unnecessary and potentially harmful treatments. In practice, biopsies from proteinuric boys and men that reveal focal global glomerulosclerosis and mild segmental foot process effacement should at least raise suspicion of Dent disease and trigger a screen for urinary LMWP and consideration of genetic testing. A recent study described that the urinary proteome of patients with Dent disease was enriched with proteins actively involved in interstitial matrix remodeling, including TIM1, TIM2, and MMP9 (24). This combination suggests activation of profibrotic pathways. Although the primary trigger is not currently known, antifibrotic drugs might potentially be beneficial. Nephrocalcinosis has been reported as an important feature of Dent disease of both types (8,25–27). In this study, only a minority had microscopic nephrocalcinosis. However, most percutaneous renal biopsies do not include corticomedullary tissue, the site of nephrocalcinosis in Dent disease. How does the nephrocalcinosis arise in Dent disease? The degree of hypercalciuria is not necessarily marked. Could the interstitial fibrosis be a response to interstitial crystals or signal release by cells in response to crystals? Could the defects in endocytosis lead to abnormal cellular processing of crystals that adhere and are internalized? Could the apical expression of adhesion molecules be upregulated? Many questions remain to be answered. Limitations of this study include the relatively small size of the cohort, although currently, this is the largest reported collection of patient biopsy data for this rare genetic disease. In addition, certain laboratory characteristics, such as urinary albumin levels, were only available in a minority of the patients, thereby limiting statistical analysis. Although some clinical features may vary among patients from different backgrounds, the critical phenotypes (elevated LMWP and impaired kidney function) were consistent between this study and others in the literature (Supplemental Table 2, 28–31). However, biopsy selection bias may exist, because patients with a CKD phenotype and possibly, older patients may have been biopsied more frequently than patients without CKD and/or with typical tubular presentation. The numbers of patients with follow-up renal function data were somewhat limited, and among these, the fall in eGFR, in general, is rather steep (Figure 3). Thus, the power to detect predictors of GFR decline after biopsy may have been limited. The pathologic features were also analyzed primarily by review of official pathology reports, because slides were available for direct review by the authors for only a small subset of the patients. However, the consistency of pathologic findings reported by different pathologists from different facilities combined with the findings in the reports matching those observed on the actual slides when available were convincing evidence that the pathology reports in this study were reliable. In summary, this study shows that focal global glomerulosclerosis is common in Dent disease, particularly among older patients and those with lower eGFR. Foot process effacement was frequently observed, and it was associated with kidney function at the time of biopsy and during follow-up but mild and segmental. Nevertheless, glomerular pathology specifically involving podocytes, because of the lack of ClC-5 protein, may play a role in the progression of renal disease. The marked glomerulosclerosis may also result from a maladaptive response to the ongoing tubulointerstitial injury. However, further studies are needed to test this hypothesis and investigate the underlying mechanisms that may lead to the disclosure of new therapeutic targets for Dent disease. We thank Alicia Meek for her assistance in data collection. This study was supported by Rare Kidney Stone Consortium grant U54KD083908, a part of the Rare Diseases Clinical Research Network, an initiative of the Office of Rare Diseases Research, the National Center for Advancing Translational Sciences (NCATS). This consortium is funded through a collaboration between the NCATS and the National Institute of Diabetes and Digestive and Kidney Diseases. The study sponsor had no role in study design; collection, analysis, and interpretation of data; writing the report; and the decision to submit the report for publication. This article contains supplemental material online at http://cjasn.asnjournals.org/lookup/suppl/doi:10.2215/CJN.03710416/-/DCSupplemental. Salt-Losing Tubulopathies in Children: Whats New, Whats Controversial?